For other uses, see Follow That Dream (disambiguation). 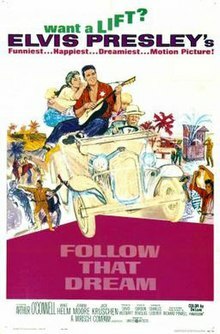 Follow That Dream is a 1962 American musical film starring Elvis Presley made by Mirisch Productions. The movie was based on the 1959 novel Pioneer, Go Home! by Richard P. Powell. Producer Walter Mirisch liked the song Follow that Dream and retitled the picture. The movie reached #5 on the Variety weekly Box Office Survey, staying on the chart for three weeks, and finishing at #33 on the year end list of the top-grossing movies of 1962. A vagabond family composed of Pop Kwimper (Arthur O'Connell); his good-natured but unsophisticated son, Toby (Elvis Presley); and various informally "adopted" children, including their babysitter, a nineteen-year-old named Holly Jones (Anne Helm), is traveling through Florida. Pop drives onto an as-yet-unopened section of a new highway. The car runs out of gas and the Kwimpers intend to wait until a government vehicle passes by to help them out. In the meantime, they set up a temporary camp. After a time, the first vehicle to come by belongs to state highway commissioner H. Arthur King, who is appalled that the Kwimpers' presence on the pristine highway might negatively impact its dedication ceremony that day featuring the governor of Florida. King tries to have the Kwimpers forcibly removed, but when the governor himself arrives in advance of the ceremony, Pop informs him that they are invoking the state's homesteading laws and plan to live near the highway permanently. The governor applauds the Kwimpers' pioneering spirit and tells the police to respect "private property." King, who considers the Kwimpers to be a huge nuisance, leaves angrily and vows to return. Holly tells Toby she is thrilled by the prospect of homesteading because she's never had a real permanent home. A chance encounter with an avid fisherman (Herbert Rudley) gives Holly an idea. With the help of a $2,000 bank loan, they build a thriving business catering to sports fishermen. Trouble soon follows. King has the Kwimpers cut off from all social assistance from their home state. Shortly thereafter Toby rejects the advances of an amorous social worker named Alisha Claypoole (Joanna Moore), an ally of King. In an act of revenge, she begins legal action to have the children taken away from Pop and make them wards of the state. Since the area is technically outside the jurisdiction of any law enforcement, two gamblers (Jack Kruschen and Simon Oakland) soon set up a raucous casino in a trailer. They attempt to buy the Kwimpers' land and belongings, but Pop refuses to sell at any price. Toby becomes the new community's sheriff and tries to quell the noise coming from the casino every night. His presence as a law-enforcement officer causes the casino patrons to flee. The gamblers attempt violent means to get their way. However, Toby naively but successfully deals with the casino's armed thugs. In the end, Toby's earthy wits and honesty win over the judge at the children's custody hearing. The judge orders the children to be returned to Pop and also praises the Kwimpers' pioneer spirit in his statement to the court. The family happily returns to its new land and home. Holly also gets Toby to recognize that she is a grown woman, and it is implied they will soon marry. The title Follow That Dream was chosen, allegedly, because the songwriters could not find a rhyme for "pioneer". At first, Powell was unhappy that Presley had been chosen for the role, but after seeing the finished film he thought Presley had done a good job. Filming began July 6, 1961 in the summer heat of Florida. It was filmed in Citrus, Marion, and Levy Counties, specifically Inverness, Ocala, Inglis and Yankeetown. The courtroom scene took place in the 1912 Citrus County Old Courthouse in Inverness which has been restored and is listed in the National Register of Historic Places. Part of the courtroom restoration can be directly attributed to the film in that it was the only record of the original courtroom configuration. Yankeetown memorializes Elvis's stay in the form of a major highway, Follow That Dream Parkway. The parkway was so named because of the efforts of four Elvis fans. After months of meetings, the parkway had a grand opening under its new name, Follow That Dream Parkway, on July 27, 1996. The dedication and celebration was held in Inglis. The bank scene was filmed in Ocala at a bank on Silver Springs Boulevard. "Elvis was a damned good actor and played some damned good scenes," said Gordon Douglas. "He could do more than sing." During filming, Elvis met Tom Petty, who was only 10 years old at the time (he would turn 11 in the October of that year). Petty's uncle was involved in the production of the movie. Shortly afterwards, Petty swapped his slingshot for a friend's collection of Elvis records.. He also met and was photographed by future country singer/songwriter Ronny Elliott, then 14 and native of Tampa. Douglas "always wondered" why the film was called Follow that Dream. "It sounded like a Doris Day picture". Reviews from critics were mixed. Bosley Crowther of The New York Times wrote, "Judging by this laboriously homespun and simple-minded exercise about just plain folks, somebody must have decided that the Presley films have been getting a little too glossy lately. In any case, compared to yesterday's serving of corn-meal mush (from United Artists), 'Blue Hawaii' was caviar." A review in Variety stated that "by Presley pix standards, it's above average ... Presley conveys the right blend of horse sense and naivete in his characterization, and delivers five songs with vocal competence and nary a wiggle." Harrison's Reports graded the film as "Good," lauding it as "a smoothly-paced, warmth-giving attempt at story-telling, which may even rub off on the adults thus giving the box office take a nice boost." Richard L. Coe of The Washington Post called the film "absurd nonsense," adding, "Presley's guitar is along for several ballads, delivered with reasonable restraint. I don't object to him as a performer, in fact he does reasonably well by a character that seems to be a cross between Li'l Abner and Tammy. What is objectionable is the tasteless corn and frankly political pitch." The Monthly Film Bulletin dismissed the picture as "a rag-bag of film conventions, handsomely photographed by Leo Tover, but barely memorable." ^ a b Davis, Ronald L. (2005). Just making movies. University Press of Mississippi. p. 199. ^ a b Wallechinsky, David (2009). The Book of Lists. USA: Canongate Books. p. 480. ISBN 1847676677. ^ Crowther, Bosley (August 9, 1962). "Presley in Florida". The New York Times: 17. ^ "Follow That Dream". Variety: 6. March 28, 1962. ^ "Film review: Follow That Dream". Harrison's Reports: 55. April 14, 1962. ^ Coe, Richard L. (May 19, 1962). "Elvis, Corn and Politics". The Washington Post: C13. ^ "Follow That Dream". The Monthly Film Bulletin. 29 (342): 94. July 1962.
Review of the movie collection "Elvis: MGM Movie Legends Collection (Follow That Dream, Kid Galahad, Frankie and Johnny, Clambake) by Paul Mavis at DVD Talk, July 24, 2007.
Review by Stuart Galbraith IV at DVD Talk, May 25, 2004.